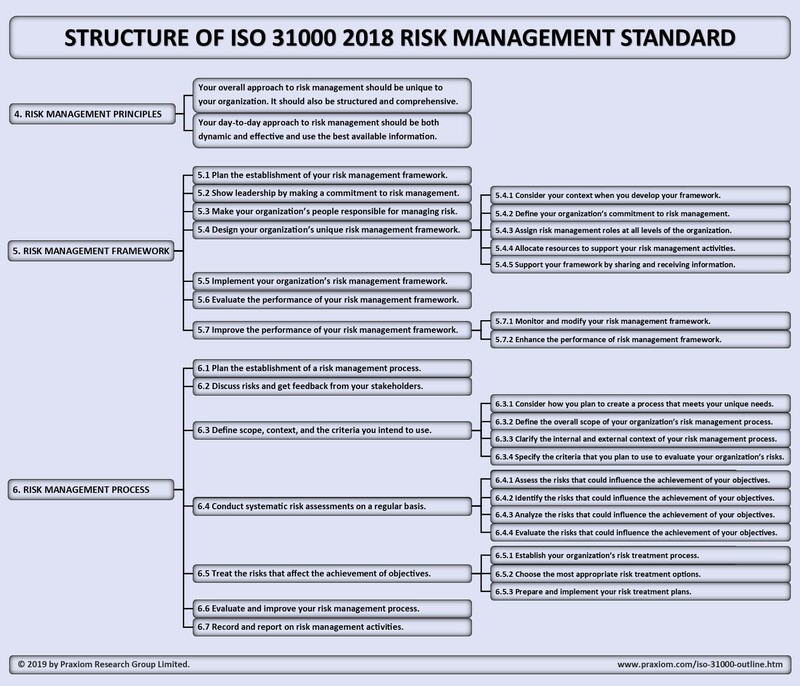 This page presents a brief outline of the new ISO 31000 2018 Risk Management Standard. Develop an approach that is structured and comprehensive. Make sure that your risk management approach is effective. Make sure that your risk management approach is dynamic. Make sure that your risk management approach is customized. 5.1 Plan the establishment of your risk management framework. 5.2 Show leadership by making a commitment to risk management. 5.3 Make your organization’s personnel responsible for managing risk. 5.4 Design your organization's unique risk management framework. 5.4.1 Consider your context when you develop your framework. 5.4.2 Define your organization's commitment to risk management. 5.4.3 Assign risk management roles at all levels of the organization. 5.4.4 Allocate resources to support your risk management activities. 5.4.5 Support your framework by sharing and receiving information. 5.5 Implement your organization's risk management framework. 5.6 Evaluate the performance of your risk management framework. 5.7 Improve the performance of your risk management framework. 5.7.1 Monitor and modify your organization's risk management framework. 5.7.2 Enhance the overall performance of your risk management framework. 6.1 Plan the establishment of a risk management process. 6.2 Discuss risks and get feedback from your stakeholders. 6.3 Define scope, context, and the criteria you intend to use. 6.3.1 Consider how you plan to create a process that meets your unique needs. 6.3.2 Define the overall scope of your organization's risk management process. 6.3.3 Clarify the external and internal context of your risk management process. 6.3.4 Specify the criteria that you plan to use to evaluate your organization's risks. 6.4 Conduct systematic risk assessments on a regular basis. 6.4.1 Assess the risks that could influence the achievement of your objectives. 6.4.2 Identify the risks that could influence the achievement of your objectives. 6.4.3 Analyze the risks that could influence the achievement of your objectives. 6.4.4 Evaluate the risks that could influence the achievement of objectives. 6.5 Treat the risks that affect the achievement of objectives. 6.5.1 Establish your organization's risk treatment process. 6.5.2 Choose the most appropriate risk treatment options. 6.5.3 Prepare and implement your risk treatment plans. 6.6 Evaluate and improve your risk management process. 6.7 Record and report on risk management activities. Updated on March 31, 2019. First published on August 8, 2018. Copyright © 2018-2019 by Praxiom Research Group Ltd. All Rights Reserved.